Elgar, Frank: Modern Painting V. Abstract Painting. The Little Library of Art. London , Methuen , 1965. 16mo., pp. 48. Colour illustrations throughout. Paperback, colour illustration on front cover. 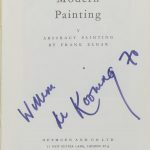 Signed on title-page ‘Willem de Kooning 70’. 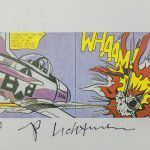 Postcard of Lichtenstein’s painting ‘Whaam! 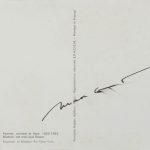 1963’ signed in bottom blank margin ‘To Peter[,] Roy Lichtenstein’. Postcard of Ernst’s painting ‘Femme, vieillard et fleur’ (1923–4) signed on verso ‘Max Ernst’. Postcard of Dubuffet’s painting ‘Spinning Round’, signed on verso ‘Jean Dubuffet’. The card comes with its original envelope, from Dubuffet’s secretary and addressed to a recipient in West Yorkshire . It is postmarked 14 February 1982 . 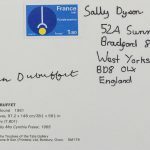 The same recipient has self-addressed the actual postcard and added a stamp to this, presumably so that it could have been put by Dubuffet or an assistant straight in the post. 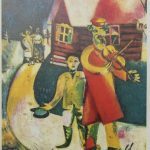 Postcard of Chagall’s painting ‘The Fiddler’, signed at the bottom ‘Marc Chagall’, with attached to the verso, a full sheet of United Nations 6 cents stamps of the Chagall Window, 1967 (the image of the window is spread over six separate stamps). 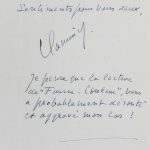 With an envelope, possibly self-addressed to a recipient in West Yorkshire , postmarked 29 May 1981, and with a return address of V. Chagall in St. Paul de France. Full-page 4to. 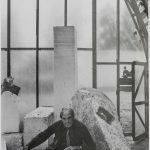 photograph of Moore , in his studio at Much Hadham, Herts., inscribed in blank bottom margin ‘to James & Sally from Henry Moore’. The photograph has been printed on a page of normal rather than photographic paper and from its thickness, appears to be taken from a book or high- quality magazine rather than from e.g. a newspaper supplement. On the verso is a description of photographing the Regius Professors of Oxford, with a list of the subjects of this other. 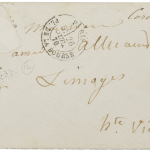 Envelope, to an indecipherable addressee in Limoges, postmarked Paris, 26 July 1870, in hand of Corot, with stamp torn out, sender is given in top right hand corner as ‘Corot’. 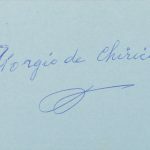 Blue card, signed on one side ‘Giorgio de Chirico’. 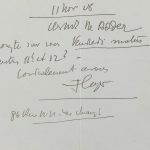 Note from Leger, one side of octavo, written crossways and folded, dated 11 November 1928, to a recipient with an almost indecipherable name, possibly called Claude de Rodder, saying that he is expecting him Friday morning between 11.00 and 12.00. With a postcard of Leger’s painting ‘La partie de campagne’.